The inevitable has finally come to pass: Noel Gallagher will release his debut solo album in October. Noel Gallagher's High Flying Birds will be released October 17 and Gallagher will be backed by the High Flying Birds when he tours to promote the record being released on his own label, Sour Mash Records. While Gallagher was coy about his desire to do a solo record throughout his tenure as Oasis' chief songwriter, lead guitarist, and occasional vocalist, many fans of the band have been waiting for this day for a very long time, and I am one of them. High Flying Birds, a 10-song set, was co-produced by Gallagher and Dave Sardy, who helmed Oasis' Don't Believe The Truth. Oasis fans will recognize a couple of the titles of these songs, among them "Stop The Clocks." The song title was known by Oasis fans and was actually used to title the first Oasis compilation, yet the song was not included. "(I Wanna Live In A Dream In My) Record Machine" is another title Gallagher mentioned while still in Oasis. Gallagher revealed at a London press conference he'll release a second record next year as part of his ongoing collaboration with Amorphous Androgynous. That album remains untitled, with more details likely to follow. 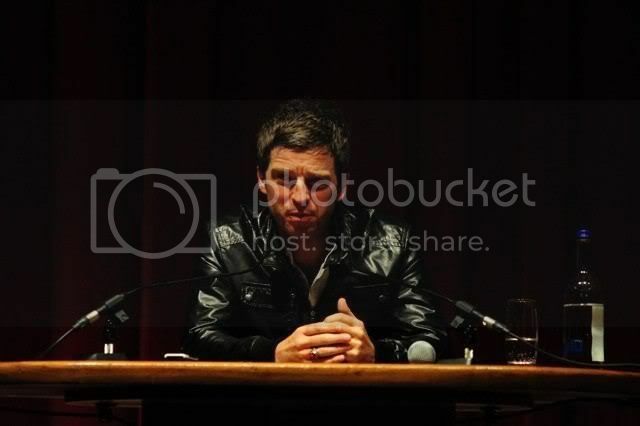 The press conference will later be posted on noelgallagher.com as well as YouTube and we'll post that link here when it comes available. Noel's brother, Liam, and the remaining members of Oasis' final lineup formed the band Beady Eye, who released their debut record Different Gear, Still Speeding earlier this year.